Umberto Giordano’s Andrea Chenier is one of opera’s guiltiest pleasures. Critics fall all over their computers deploring its second rate status, but audiences love it when it’s properly cast and led. To bring off the work you must have a big voiced Verdi tenor, soprano, and baritone. My first experience with Giordano’s potboiler was with Richard Tucker, Zinka Milanov, and Leonard Warren in the critical roles. They set a standard which I have yet heard equaled. But SF Opera’s lead trio last night came pretty close. Why do “experts” hold their noses when contemplating Andrea Chenier? I suppose it’s because it doesn’t have the depth and ingenuity that Verdi and Puccini have. Interestingly, Brian Kellow in his program notes repeatedly denigrated Puccini in a strange and gratuitous attempt to enhance Giordano’s stature. OK, so the opera is not Verdi. Also, when the three principals are not on stage the score flags a bit. But on balance this is a fine opera that has kept its place in the standard repertory since its premiere in 1896. As this production marks the first SF Opera staging of the work since 1992, the local impression in the Bay Area press and from the pre-performance lecture was that Andrea Chenier is not staged very often. The Met has done it 185 times which places it 43rd on the company’s list of operas by performance frequency. Regardless of how often it’s done, the company had three principals who are likely the equal or superior of any now active. Combined with a uniformly excellent supporting cast, Nicolas Luisotti’s conducting, and director David McVicar’s opulent staging the result was grand realization of Giordano’s thrilling score. The title role requires a spinto tenor of considerable vocal force and stamina. He has four arias and two big duets. Korean tenor Yonghoon Lee is just about the best Chenier now operative. he had bright baritonal tenor of extraordinary size. His was clearly the largest sound of the evening. His ardent delivery and slender good looks made him the best Chenier I’ve heard since Placido Domingo 40 years ago. Lee is not scheduled to sing at the Met this season, but he’s Pollione in Dallas Opera’s Norma next Spring. Worth hearing if your in the neighborhood. George Gagnidze as Carlo Gerard was an outstanding remorseful revolutionary. His voice is not the largest baritone around, but it has the right sound for Gerard. Gagnidze delivered a forceful and nuanced reading of ‘Nemico della patria’ which was very well appreciated by the audience. All the notes were there for a part that is as difficult as many of Verdi’s great baritone roles. Maestro Nicola Luisotti has this style of opera entirely in his baton. He led the SFO orchestra in a passionate account of Giordano’s interesting, if not the most intricate of its time, score. Musically the whole production was splendid and well worth attending. This leaves David McVicar’s new production first staged last year at Covent garden. It is sumptuous. Robert Jones’ sets and Jenny Tiramani’s costumes are realistic and almost perfectly recreate the period just before and after the French Revolution of 1789. The almost is because of the powdered wigs and pre-revolutionary uniforms worn by the post-revolutionary soldiers. The sets and costumes were so good that I wished they’d been created for an opera that really needs them. Chenier does fine when you have the right soprano, tenor, and baritone, which SFO did. 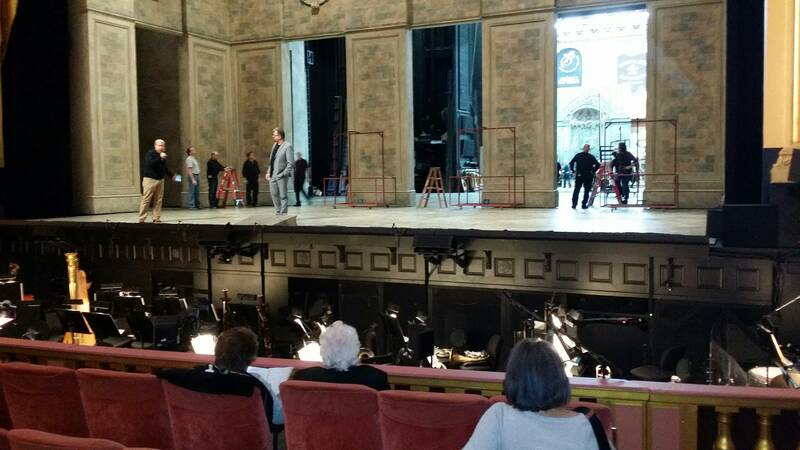 The company decided to open the curtain during the show’s only interval to let the audience see the change of sets while two members of the production team described what was going on – see photo below. An interesting innovation. Click on the picture for a larger version. I happen to love “Andrea Chenier” in spite of its flaws and actually saw both performances that SF Opera has given so far. Opening night on Sep. 9th was enjoyable enough but the second performance on Sep.14th was, in my opinion, well below average. In neither performance did I see any chemistry between the principal characters and in both, Nicola Luisotti drowned the singers with the loud orchestra and hampered them with his extremely slow tempi. The tenor Yonghoun Lee struggled so hard that I felt sorry for him. His voice is totally wrong for verismo. For my money, I still prefer the old SF Opera production, especially for act IV. Chenier has been a super favorite with me since I discovered it at 16. At 19 I got to see Corelli in Fanciulla. When getting his autograph he asked ” “Will you come to Chenier?” Would I!!!!! Two weeks later after hours of driving in heavy rain we got to the L A Music Center to be told that performance had been sold out for 2 months!!! So we waited. It was later in the afternoon there was a cancelation. Just as we were getting it a huge guy came in and grabbed it!! Horror!! But that awful rain paid off as 2 cancelations came in for us later. Not only did we get the fantastic Corelli, but Tebaldi and Batistianni too.